It's summer and that means it's salad time! Always on the prowl for great light dressings, I'm pleased to report that one of the newest products in the Newman's Own Lighten Up Dressing line is a fabulous sun dried tomato flavor*. This tasty dressing has just 60 calories and 4 grams of fat per the 2 tablespoon serving. It's all natural with yummy ingredients like red wine vinegar, sun dried tomatoes and olive oil. What's not to love?! I simply adore tomatoes! The wide variety available this time of year call out for creative uses. This tomato-basil salad provides a bright burst of flavor as a side dish for lunch or dinner. Be sure to use well-ripened, local cherry tomatoes if you can. The flavor will be much better. 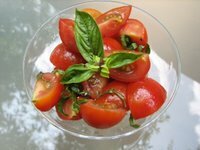 Grape tomatoes from the grocery store will work in a pinch if fresh, local tomatoes aren't available. 1. Toss all ingredients together and serve. 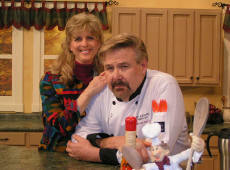 California cutie, Colleen Patrick-Goudreau, earned VegNews magazine's 2005 Vegan Martha Stewart Award. And for good reason! Her "Compassionate Cooks" DVD has garnered national awards and her backyard vegan barbeque was filmed and aired on The Food Network. 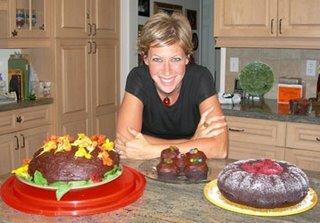 She leads popular cooking classes, nutrition courses, workshops, lectures, and farmed-animal sanctuary tours. Colleen's big smile and tasty recipes are proof that being vegan is not only compassionate, but it's fun, too! What I most enjoy is when we're at mixed dinners such as a wedding and people always covet what we're eating. Of course, the hosts make sure we have fantastic food, and the people at our table always say they wish they knew they could have requested something other than the "chicken" or "beef." However, we did have one bad wedding meal experience, which we still laugh about today: how can anyone think you'd be satisfied with a plain raw tomato with some steamed carrots?! We host Thanksgiving every year, and all of our guests contribute to our feast. Our families live on the opposite coast, but when they visit for holiday dinners, they enjoy our delicious vegan menu; and the last time we visited our family for the holidays, in exchange for us cooking, they were happy to have an entirely vegan spread. Family and friends are more accommodating than people think they would be. That's a tough question! Let's just say it would be torture to live without tempeh, almond butter, chocolate and quinoa. Jim Mason's "An Unnatural Order "changed my mind about so many aspects of our human-centric society. My favorite cookbook is Jennifer Raymond's "A Peaceful Palate." I love tofu, and I LOVE tempeh. The same thing I have every day! Green tea, plus a Berry Fruit Smoothie made with almond milk and almond butter. I'm drinking it right now! YUM! When I was a child, my sister and I spent long summer vacations staying with our maternal grandparents in their giant old house. The memories of that house and our days spent there stay with me still. One of the most vivid memories I have is waking up on Sunday mornings to the sound of old time gospel music playing on the record player and the air filled with the smells of coffee brewing in the percolator and breakfast frying in a black cast iron skillet. That skillet hardly left the stovetop. Like most Appalachian women, my grandmother used cast iron cookware for nearly all of her cooking needs. Cast iron is an ideal heat conductor and so heats evenly and consistently, making it ideal for cooking, frying, searing and even baking. The versatility of the iron pot or skillet is unrivaled – it can be used on the stovetop, grill, oven or over an open flame. Cast iron cookware went from the hearth to the wood stove to the gas and electric range with ease, adding a kitchen touchstone as times changed in the mountains. For early mountaineers, cast iron pots also served important roles outside the kitchen. The larger cauldrons were used throughout the hills for boiling water for laundry, making soap, cooking apple butter and hominy and rendering lard. 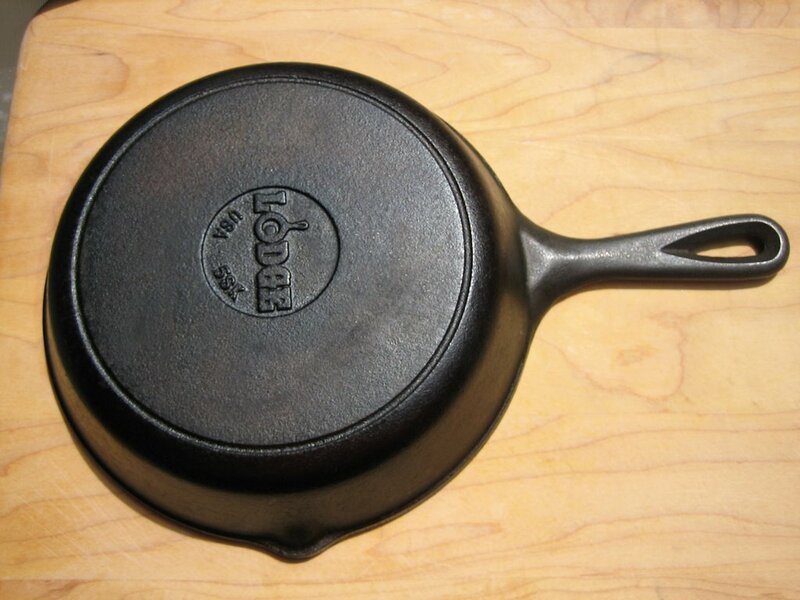 Cast iron cookware remains widely available and still is incredibly inexpensive. Most hardware stores, general stores and old-timey gift shops sell national brands for $4-$20. Unlike cheap aluminum pans, cast iron will not buckle or warp. Some research has shown that aluminum pots leach aluminum molecules into food, which can lead to serious health problems. Not so with cast iron, which adds only small amounts of safe iron to cooked food. With proper seasoning and care, cast iron skillets can last for generations. When I was five years old, my great grandparents’ farm burnt to the ground during a blizzard. Weeks later, family members sifted through the ashes hoping to find some intact items. My step dad found a 12-inch cast iron skillet. He re-seasoned it and uses it to this day. I think it’s safe to say that most other cookware could not withstand a house fire and three generations of use. Appalachians’ beloved cast iron cookware truly is remarkable. I love my three cast iron skillets. I use the large and small for cooking and frying and the medium-sized skillet for baking corn bread. All have been seasoned and now have non-stick surfaces. Besides being an incredibly practical kitchen tool, I also adore cast iron skillets because they are traditional. 1. Purchase a cast iron skillet in a size that best fits your needs. 2. Thoroughly wash the skillet, using a stiff brush, hot water and a bit of soap. Dry. 3. Assemble paper towels, oven mitts and a high-quality cooking oil near the stovetop. 4. Place the skillet on the stovetop over very high heat. Allow the skillet to get very, very hot (Plan on the skillet smoking a bit – open a window and run the range hood vent). 5. When the skillet is too hot to hold your hand a few inches above it, remove from heat. Immediately pour a few tablespoons of oil into the skillet. While wearing the oven mitts, use paper towels to rub the oil into the entire inside and outside surface of the skillet. Wipe out excess and allow skillet to cool completely. 6. The skillet is now ready to use. You may have to repeat this process 1-2 times more for the skillet to be properly seasoned. 7. Finally, proper long-term care is vital. Use solid fats in your cast iron skillets as much as possible. Cooking sprays and oils tend to build up a sticky film in the skillet. And never wash a seasoned skillet with soap or place in a dishwasher. Simply scrub out the skillet with a stiff brush and very hot water. Dry completely with a paper towel and store in a dry place. Organic snackers rejoice! 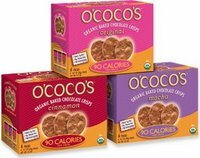 O’coco’s oganic chocolate crisps* are here! If you’ve been looking for a healthier alternative to portion-perfect single serving snacks, these are just the sweet treats for you. Packed with great taste, O’coco’s have only 90 calories and 2 grams of fat per serving. Each crunchy, whole-wheat cookie is free of nasty trans fats and high fructose corn syrup. They come individually packaged in three awesome flavors – original chocolate, mocha and cinnamon. We’re crunch happy over these rocking new treats. Look for them wherever healthy foods are sold or order online at: www.ococos.com/. I love to wake up on weekend mornings and bake a batch of muffins. I ususally stir up something to fit the season and serve with coffee, tea and fruit. It makes a special breakfast for the family or when we have house guests. Last month when I was home, my dad gave me some beautiful zucchini. 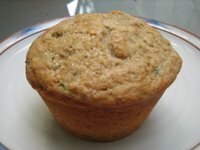 Those tender veggies inspired this muffin. 1. Preheat oven to 400 degrees. Spray a large muffin tin (6 muffin capacity) with cooking oil. Set aside. 2. In a large bowl, whisk together whole wheat pastry flour, unbleached flour, oat bran, brown cane sugar, baking powder, ground flaxseed, spices and sea salt. 3. 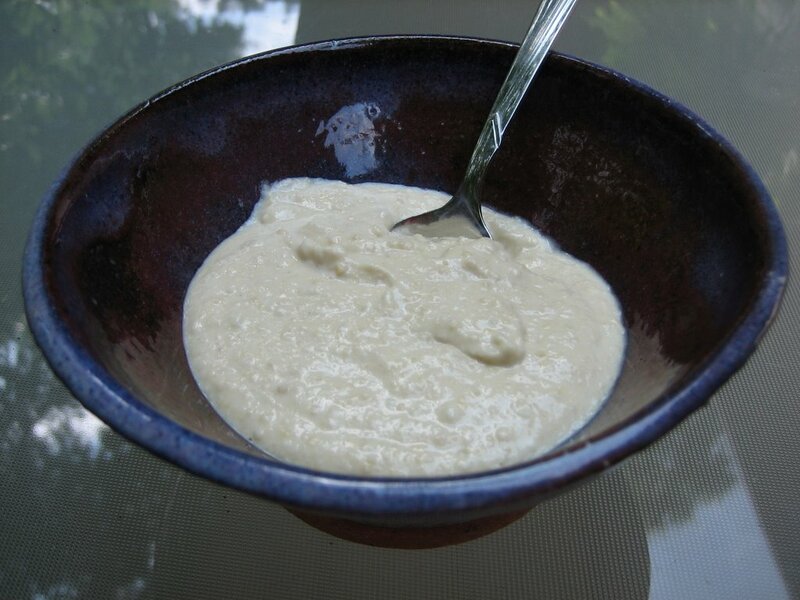 In a medium mixing bowl, whisk together milled cane sugar, soymilk, canola oil, vanilla and egg. 4. Add soymilk, egg, butter and vanilla. Using a rubber spatula, stir until just combined. 5. Gently fold in zucchini and pecans. 6. Evenly spoon into prepared muffin tin. Evenly sprinkle about ½ teaspoon of Demerara sugar over each muffin. 7. Bake in preheated oven for 25-30 minutes or until probe inserted in the center of a muffin comes out clean. 8. 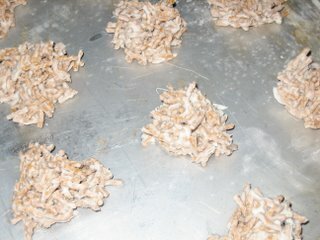 Cool on wire rack for 5 minutes and then remove from tin to finish cooling. Serve warm. Here's a bad idea: the U.S. Department of Agriculture announced today that is is scaling back its testing for mad cow disease from 1,000 to 110 cows per day. We have a new family in the neighborhood -- wild turkeys! This flock has four chicks and four adults, including one stunning albino turkey that was camera shy. They've visited our yard to peck at bugs several times now. 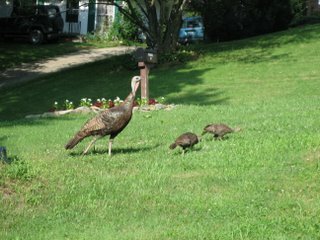 My husband and I enjoy sitting quietly watching them -- they are so majestic we just can't understand how someone could eat such a fine bird! Hummus is everywhere! But this trendy dip is expensive to buy. You can make it yourself with very little effort -- but truly good recipes are hard to come by. This one is great (I promise) and is inspired by Doe's Pita, a sandwich chain in Charleston, South Carolina. 1. Place all ingredients in a food processor or blender. Blend until smooth. 2. Use immediately or place in a covered container and store in the refrigerator. I really wanted to like this product. I love most of Celestial Seasonings' teas and was thrilled when I saw their new line "Zingers to Go," individual packets of powered drink mixes. Such mixes are everywhere and come in a wide assortment of flavors but most are chock full of artificial flavors, colors and sweeteners -- not my cup of tea, so to say! I took a packet of the Celestial Seasonings' brand to work, mixed it into cold water and prepared to be refreshed. All I can say is, "YUCK!" The drink was extremely bitter with almost no flavor. While the ingredients are superior, the packaging is clever, and the price is right, I won't be buying this drink mix again -- and neither should you. Newswise (07/17/06) — Two recent studies offer new evidence suggesting an alternative form of natural vitamin E can be taken by mouth and will reach the blood in humans at levels determined to protect against stroke and other diseases. 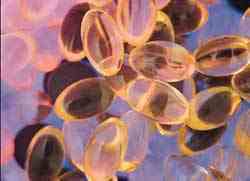 Vitamin E occurs naturally in eight different forms. The primary vitamin E on drugstore shelves is called tocopherol, or TCP. But another natural form of vitamin E surfacing as a potent neuroprotective agent in repeated Ohio State University Medical Center studies is tocotrienol, or TCT. This form, while not abundant in the American diet, occurs naturally in palm oil; this vegetable oil is increasingly used in prepared foods because it has no trans fat. In the first study of this form of the nutritional supplement in humans, Ohio State researchers determined that a moderate dose of tocotrienol reached concentrations in human blood plasma that would be more than adequate to protect against neurological damage that follows stroke. These findings were published in the May issue of the journal Antioxidants & Redox Signaling. In a separate study, the scientists determined that TCT is effective at two concentrations, one at which it functions as an antioxidant, and another, lower concentration at which the supplement offers non-antioxidant protection. Both functions of TCT are directed against neurodegeneration. These findings were published June 26 in an online edition of the Journal of Neurochemistry. In the first study, collaborating scientists at Wayne State University fed participants 400 milligrams of a time-release formulation of a supplement containing primarily TCT. Researchers collected blood samples from the participants two, four, six and eight hours after supplementation. Sen said the maximum TCT concentrations in the bloodstream of supplemented patients averaged concentrations between 12 and 30 times higher than that needed to completely prevent stroke-related neurodegeneration as determined by earlier research. Conventional wisdom has suggested that TCT, if eaten, cannot be carried to organs because the protein known as tocopherol transfer protein (TTP), which delivers TCP throughout the body, doesn’t transport TCT very well. “Our results demonstrate that TCT is efficiently delivered to the bloodstream despite the fact that the transfer protein has a lower affinity for TCT than it has for TCP,” Sen said. Absorption of TCT is increased when the supplement is taken with fat-containing food, so the research participants took the study supplement with a high-fat (60 grams) meal to increase the efficiency of absorption. The findings corresponded closely with previous work as well as the more recent study that sought to determine the levels at which TCT functions as an antioxidant, an agent that protects cells against the effects of free radicals. Free radicals are potentially damaging by-products of energy metabolism that can damage cells and are implicated in the development of cardiovascular disease and cancer. The tocopherol, or most common, form of vitamin E is known for its antioxidant properties. In previous studies, the scientists found that moderate oral doses of TCT before a stroke significantly reduced stroke injury in hypertensive rats. In the more recent study published in the Journal of Neurochemistry, researchers observed the effects of TCT on neurological damage that can be caused in two different ways: through the presence of homocysteic acid, which in excess can cause vascular and neuronal lesions associated with cardiovascular disease, and the fatty acid linoleic acid, which can directly stimulate damaging free radical activity. Fatty acids are related to stroke: They rapidly accumulate when a clot in a vessel stops blood flow to the brain, and play a role in irreversible brain injury. To observe the TCT’s effectiveness, rodent neural cells were pretreated with extremely low concentrations of TCT; these cells avoided the cell death associated with toxicity caused by homocysteic acid. But to reduce free-radical activity and resulting neurotoxicity, the scientists found that a higher concentration of TCT was needed: Tocotrienol does not exhibit antioxidant properties until it reaches a concentration 10 to 25 times stronger than the concentration that prevented the cell death signal. The National Institutes of Health supported this research. Ohio State co-authors of the Journal of Neurochemistry study were Savita Khanna, Sashwati Roy, Narasimham L. Parinandi and Mariah Maurer, all with the Davis Heart and Lung Research Institute. Ohio State co-authors of the Antioxidants & Redox Signaling paper were Viren Patel, Khanna and Roy, all of the Laboratory of Molecular Medicine. Newswise (07/17/06) — Van Morrison sang about it, Peter Fonda starred in a movie about it, and people from all over the world will pay top dollar just to get some of it. It's tupelo honey, a honey so distinct, light and smooth that people describe it as they would a fine wine. But the future of tupelo honey production may not be so sweet. Florida State University geography Professor J. Anthony Stallins and doctoral student Kelly Watson are studying factors that could affect the future of beekeeping operations in Northwest Florida - one of the only places in the world where tupelo honey is produced commercially. Watson has a $15,000 grant from the U.S. Community Forestry Fellowship for Dissertation Research to work with beekeepers and study the tupelo forests surrounding Wewahitchka, Fla. "Wewa," as the locals say, is a small town adjoining the Apalachicola and Chipola rivers and serves as the unofficial capital of tupelo honey. "We're hoping to paint a comprehensive picture of the challenges that face the beekeepers," Stallins said. "I don't think the public knows how hard it is to produce honey. We want more awareness of the social context of beekeeping and how environmental change and sociopolitical and economic factors play out to influence the use and access to tupelo forest." Some beekeepers say that every year they seem to be getting less honey for their efforts. Stallins and Watson will explore the degree to which changing river hydrology, exotic pests, land development and other factors are affecting tupelo honey production, an important regional industry that contributes about $2.4 million a year to Florida's economy. The researchers' findings will allow beekeepers to develop collective strategies to defend their livelihood, Watson said. That's important because helping the beekeepers will in turn help the survival of the forests along the Apalachicola River floodplain, one of the most biologically diverse ecosystems in North America. 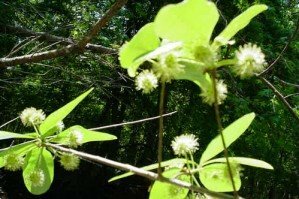 Although tupelo trees can be found elsewhere, the white tupelo from which the honey featured in the 1997 movie "Ulee's Gold" is derived is found in abundance only along the Apalachicola. "It's the preferred tree for making tupelo honey," Stallins said, explaining that this type of honey does not granulate like many honeys. "The tupelo honey derived from forests with a greater concentration of white tupelo is more likely to have the complex floral flavor when compared to other tupelo honeys." It takes a colony of 60,000 bees about 2 million nectar-gathering visits to the tupelo blossoms each spring to make a pound of honey. That task is even tougher than it sounds because some beekeepers say it is increasingly difficult to find places to put their hives. One reason is because the forest has taken a beating from more than 45 years of dredging of the Apalachicola for a river navigation project. The dumping of the dredged material has cut off many tupelo trees from their source of fresh water. Upstream water diversion also has lessened the flooding needed for a healthy tupelo forest. Exotic pests are taking their toll, and beekeepers throughout Florida are losing between 30 percent and 50 percent of their bee colonies to mite and beetle infestations. But the challenges facing beekeepers in Wewahitchka are as much political and economic as they are ecological, and it's the inclusion of those factors - zoning regulations, land development, higher property taxes and increased cost of living - that makes this study significant, Stallins said. Watson, who abandoned her dissertation on fair-trade labeling of coffee in Mexico in order to focus on what she believes is an urgent need closer to home, said her interest in the issues surrounding honey production began after one Wewahitchka beekeeper told her, "Before long tupelo honey may be a thing of the past." Indeed, many beekeeper hobbyists have abandoned the pastime and commercial producers will only harvest honey as long as it is feasible in terms of economics, time and labor, Watson said. That's a shame, she said, because beekeeping is more than just a vocation in Wewahitchka, where it has been practiced by generations. It's a way of life that gives this rural community its unique flavor. "It's part of our identity," Watson said. "It's something special to Florida." 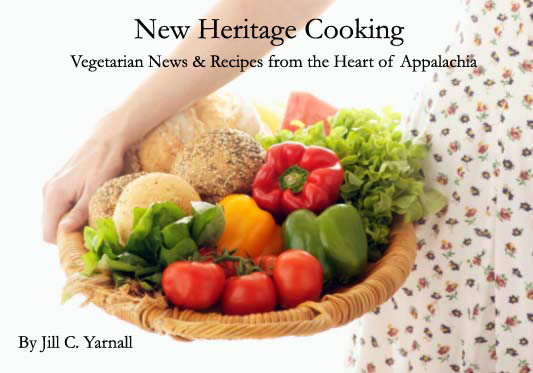 Here in the verdant Appalachians, it's summertime and that means good eating! I love cooking with all the wonderful fresh fruits, vegetables and herbs available this time of the year. To me, one of the best tastes of summer is pesto. This rich green sauce is traditional tossed with pasta, but it's also great spread on bread or drizzled over tomato soup. Fortunately, it also freezes well, so the taste can be savored all winter long. If you wish to freeze pesto, simply spoon it into ice cube trays and freeze. When it's frozen through, transfer to a freezer bag until use. Yummy! 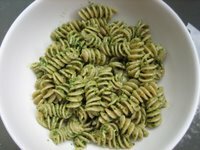 This recipe will make enough pesto for one pound of pasta with some left over to freeze or use later in the week. It's proof positive that pesto doesn't need cheese to taste delicious! 1. 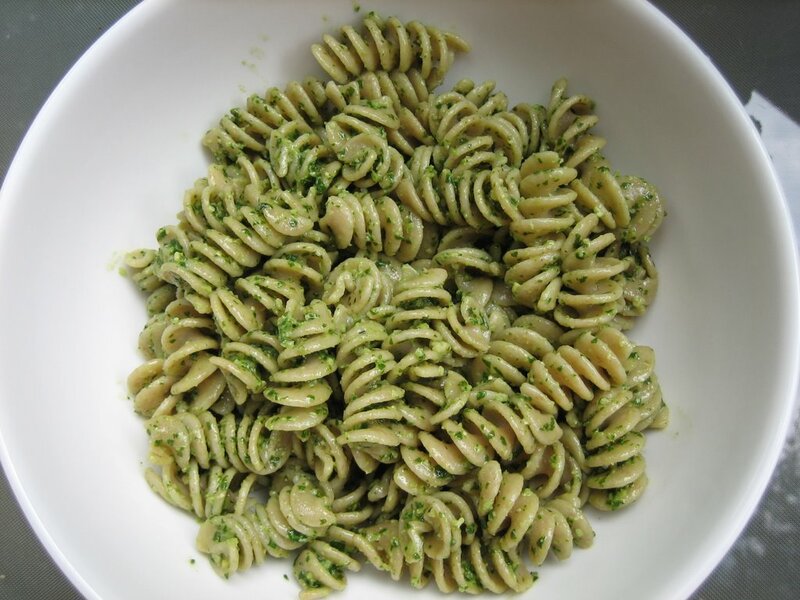 Place basil, pine nuts, garlic, parsley, olive oil and sea salt in a food processor or blender. Blend until smooth. 2. Pour pesto over hot pasta, adding a bit of reserved hot pasta cooking water if needed to moisten. Toss to cover pasta. 4. Spoon any remaining pesto into a small container and cover with a drizzle of olive oil. Refrigerate until use. Great news! North Carolina Governor Michael Easely signed HB2098 into law this morning! Thanks to all of you who called his office to urge him to do so. You made the difference, overcame the pro-cruelty lobby, and saved lives. We can have many more victories for animals if we all just make the effort. I think it can safely be said that Dreena Burton is one of Canada's most famous vegans. 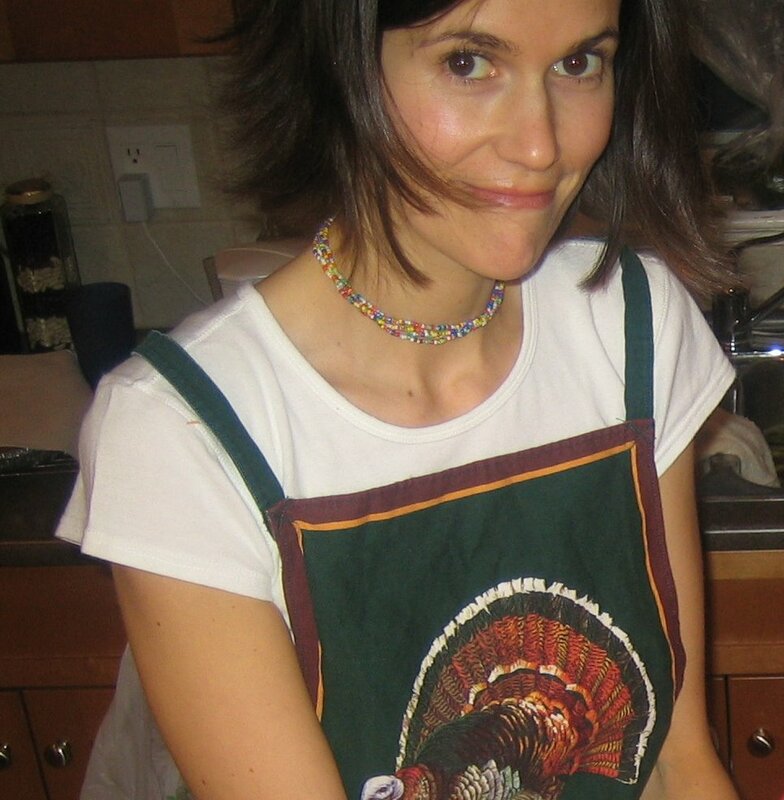 She's the author of the best-selling vegan cookbooks "The Everyday Vegan" and "Vive le Vegan." And Dreena is also a constant source of cooking inspiration via her popular blog "Vive le Vegan", regular articles in VegNews magazine, and frequent interviews on Erik's Diner podcast. We're honored to feature Dreena in our "Veggie Hero" series! Eleven years now, if I'm doing the math correctly! I gradually became vegetarian after reading "Fit For Life" in my late teens. I learned more about eliminating dairy and eggs, and after experimenting with our own diets for about a month, my husband and I made the decision to stick with vegan eating. We felt better physically and knew our choices were something we could feel good about from an ethical perspective. I was on a business trip in Norway, before I began writing cookbooks. My hotel was rather remote, and so eating at restaurants or cafes was not an option. The hotel's restaurant menu was heavily meat-based, and there were a couple of buffet-style dining hours, where my plate looked so sad... a pale green salad, some boiled potatoes, and reheated frozen peas and cut carrots. I couldn't wait to return home! I cook myself! I have cooked our Christmas dinner for the last 10 years, and it is fabulous! We have an amazing line-up of dishes, all the recipes I have included in my books (mostly from The Everyday Vegan). They include a Phyllo Potato Mushroom Pie, Stuffed Squash, Mushroom Gravy, Pureed Roasted Yams (aka sweet potatoes), Pureed Roasted Rutabega, Garlic-Sauteed Kale, Lemon-Herb Tofu (this one recipe is from Vive), sometimes a salad, oh, and for dessert, either my Tiramisu or Ice-Cream Pie. Different family members have joined us year to year, and each time the meal has been a huge hit. It's a once-a-year major cooking event, and worth every moment of prep and cooking! Must I choose? I'm far too indecisive! Rice milk, beans, fresh blueberries, and chocolate to name just a few - oh, and how could I forget non-dairy ice-creams?!! "Becoming Vegan" by Vesanto Melina and Brenda Davis is a favorite for it's nutritional information, and in terms of animal rights literature, I highly recommend Erik Marcus' books "Meat Market" and "Vegan: The New Ethics of Eating." Tofu, but I do like one brand of tempeh "burgers" (see, I told you I was indecisive!). Green tea first thing, then fresh fruit followed by a cereal mix of kamut puffs with a generous serving of hemp seed nuts and lots of rice milk. The Good News: North Carolina House Bill 2098, which outlaws hog-dog rodeos and requires individuals charged with animal cruelty to pay for the care of their animals, has passed the House and Senate with no problem and is ready for Governor Michael Easley to sign into law. The Bad News: Opponents have called, faxed and e-mailed the governor so much that HB 2098 is up for a veto discussion. How You Can Help: Please call Governor Easley's office toll-free at 1-800-662-7952 and tell the receptionist the phone that you "SUPPORT HB 2098 and want Governor Easley to sign it into law." I just called and it literally took 15 seconds. This is something you can do right now to help the animals. 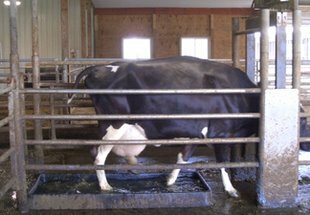 Newswise (07/10/06) — Commonly used foot baths to prevent lameness in dairy cows may not only reduce crop yields but also contribute to the copper load in farm fields. To look at how the use of the foot baths' copper sulfate affects three crops' quality and yields and to give farmers an idea of how much copper may be kept in field soil, a research project, funded by the Northern New York Agricultural Development Program (NNYADP), which is supported, in part, by Cornell University, is now under way. Copper sulfate is the most cost-effective treatment for controlling hairy heel warts that cause lameness in dairy cows. However, much of the copper sulfate used in the cows' foot baths is disposed of in manure slurry applied to farm fields. A William H. Miner Agricultural Research Institute survey of New York and Vermont farms estimates that 4 to 16 pounds of copper sulfate is applied per acre per year to some fields. Since the New York State Department of Environmental Conservation has set a lifetime load limit for copper at 74 pounds per acre, a field could reach its maximum load of copper in 4.5 to 19 years. Over those years, a farmer hopes to harvest maximum crop yields. Researchers at the Miner Institute in Chazy, N.Y., are evaluating timothy and orchard grass grown in greenhouses using controlled applications of copper sulfate on sandy loam and silt loam soils. A field study on corn is also under way. "What we want to know is how much and how well copper sulfate is tolerated by field crops," says Everett D. Thomas, vice president of agricultural programs at the institute. "We know of no research that determines how copper in sulfate form affects crop development on different soils. The data from our project will determine how the rate of copper sulfate application affects root growth, forage quality and yield." Thomas says farmers can consider several alternatives to reduce their use of copper sulfate to protect the environment and obtain desired crop yields while protecting cow foot health. Those alternatives include adjusting the amount of copper sulfate used in foot baths, reducing the frequency of foot baths, using them less in the winter and improving hoof trimming and stall surfaces. The Miner Institute, he said, was able to reduce its copper sulfate use by 60 percent and maintain its dairy herd's hoof health through good hoof trimming practices and use of rubber mats throughout the milking barn. While Thomas says it is too early to release results, "some of the results from the greenhouse study on the forage grasses were eye-opening -- big yield decreases where copper sulfate was used." He is eager, he said, to see the field corn study results. The NNYADP is a farmer-driven research and education program specific to New York's six northernmost counties (Essex, Clinton, Franklin, Jefferson, Lewis and St. Lawrence), said R. David Smith, associate professor of agricultural and food systems sustainability at Cornell and program coordinator of NNYADP. The program receives support from Cornell's College of Agriculture and Life Sciences, Cornell's Agricultural Experiment Station and New York state through the efforts of northern N.Y. Sens. James Wright and Elizabeth Little, among other sources. Newswise (07/10/06) — Researchers working in the Virginia-Maryland Regional College of Veterinary Medicine’s Center for Molecular Medicine and Infectious Diseases at Virginia Tech with funding support from Fort Dodge Animal Health Inc. have developed a vaccine to protect against Post-weaning Multi-systemic Wasting Syndrome (PMWS) in pigs, a major threat to the global swine industry. The vaccine has been patented by Virginia Tech Intellectual Properties Inc. (VTIP) and is licensed and being marketed by Fort Dodge Animal Health Inc.
PMWS, caused by the Porcine Circovirus Type 2 (PCV2), has plagued the swine industry for almost ten years. By disrupting an animal’s immune system, the virus renders the pig susceptible to a range of clinical disorders and severely constrains weight gain and development. The vaccine has been developed by Dr. X. J. Meng, a physician and virologist who is an associate professor in the VMRCVM’s Department of Biomedical Sciences and Pathology, and his former graduate student Dr. Martijn Fenaux who is now a postdoctoral associate at Stanford Medical School. 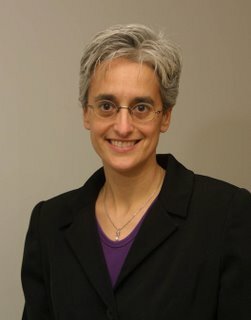 Working in the college’s Center for Molecular Medicine and Infectious Diseases (CIMMID) for almost seven years in collaboration with scientists from Fort Dodge Animal Health Inc and colleagues at the Iowa State University, Meng and Fenaux have developed a vaccine that is expected to substantially reduce economic losses in the global swine industry. First identified in the early 1990’s, PMWS has been a major problem in Europe and Asia and recent outbreaks of PCV2-associated disease, with mortality rates as high as 30 percent, have been reported in the United States and Canada. 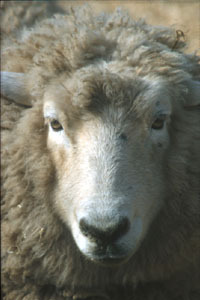 The virus can cause significant disease in 30 to 50% of the animals it infects, causing major problems for production agriculture. PMWS-associated mortality not only affects the health status of the herd, but also has a significant impact on an operation’s bottom line. For example, when mortality increases from 3 percent to 8 percent in a herd, the calculated losses are roughly $7.73 per pig, according to Fort Dodge Animal Health officials. When mortality increases to 30 percent, the losses are greater than $30 per pig. The virus affects multiple organs in pigs, targets cells in the lymphoid tissues and causes the destruction of the pig’s immune system. “The hallmark pathological lesion is a depletion of lymphoid follicles,” said Meng. Because it disrupts the animal’s immune system, the virus is a co-factor in the development of other diseases known as Porcine Respiratory Diseases Complex, he said. 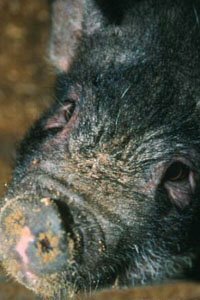 Affected pigs have a history of wasting or poor performance, failure to thrive, respiratory disease and high mortality. Because there are many unknowns about the transmission, pathogenesis, epidemiology and control of risk factors related to this disease, effective prevention is critical to the health and financial performance of the swine industry. The new vaccine offers swine producers a number of key advantages to aid in the prevention and control of these diseases. Working in the Center for Molecular Medicine and Infectious Diseases, Meng and Fenaux utilized the genomic backbone of a non-pathogenic strain of a related virus known as PCV1 to produce a chimeric virus that expresses the immunogenic antigen of the disease-causing PCV2, thereby conferring immunity but not causing disease. Meng subsequently collaborated with Iowa State University scientists Dr. Pat Halbur and Dr. Tanja Opriessnig to conduct the animal studies required to evaluate the pathogenicity, immunogenicity and vaccine efficacy of the chimeric virus. The studies revealed that the chimeric virus induces protective immunity against PCV2 infection in pigs, but retains the non-pathogenic nature of PCV1. Meng, a physician and Ph.D. virologist, operates one of the world’s top laboratories in the investigation of Hepatitis E viruses. In addition to the extensive funding he has received from Fort Dodge Animal Health Inc, U.S. Department of Agriculture, and several other funding agencies to support the PCV2 and PMWS work and his research on several other viruses of veterinary and public health concern, he has been awarded approximately $2 million from the National Institutes of Health to study the Hepatitis E Virus, which is a major threat to people and animals. Newswise (07/10/06) — A team of researchers has shown for the first time that laboratory mice infected with the agent of scrapie -a brain-wasting disease of sheep-demonstrate high levels of the scrapie agent in their heart 300 days after being infected in the brain. These findings raise the possibility that heart infection could be a new aspect of prion diseases, including those that affect humans and livestock, and that these diseases could travel through the blood. The paper wass being published on Friday, July 7 in an advanced, online edition of the journal Science. Prion diseases-also known as transmissible spongiform encephalopathies because of the sponge-like holes created in the brain-include scrapie in sheep, mad cow disease in cattle, chronic wasting disease in deer and elk, and new variant Creutzfeldt-Jacob disease in humans. These diseases are unusual because unlike other infectious diseases, prion diseases appear to be transmitted by a protein, specifically a misfolded form of a normal cellular protein, the prion. "Until now, prion disease has been thought of as a chronic neurological condition," says Scripps Research Professor Michael B. Oldstone, M.D., who led the research. "Our study has shown, however, that it can have other manifestations, therefore expanding the types of conditions it could cause." In the newly reported study, investigators at Scripps Research found infectious misfolded prion protein in heart muscle. Although several types of protein are known to form heart amyloid, this is the first time prion protein amyloid in heart tissue has been identified. Only misfolded prion proteins are infectious. After making this surprising finding, Scripps Research investigators secured the help of Kirk Knowlton, M.D., chief of the division of cardiology at the University of California, San Diego, who investigated the effect of prion protein amyloid on mouse heart function, discovering that it decreased the heart’s ability to pump blood. Significantly, unusually high levels of scrapie infectivity were also identified in the blood of the same mice used in the heart study. "This is the first system in which prion disease agents were found reproducibly and reliably at high titers in the blood," notes Oldstone. In the future, this finding could help scientists answer basic questions such as how prions travel in the bloodstream, as well as develop such important applications as a blood-based diagnostic test to identify brain-wasting diseases and possibly a way to filter or chemically treat blood to remove any infectious prion disease agents. Currently, in the United States individuals who lived in the United Kingdom for three months or more during the outbreak of mad cow disease from 1980 to 1996 are asked not to donate blood. In the United Kingdom, only individuals born after the outbreak may donate. The new research will also provide scientists with an animal model in which to study heart amyloidosis, a family of heart diseases that affect humans. Amyloidoses involve waxy protein deposits that stiffen the heart, limit its pumping ability, and typically lead to fatal heart stoppage. "Undoubtedly, this work will enable scientists to pursue new theories about the effects of these deadly brain wasting diseases," says NIH Director Elias A. Zerhouni, M.D. "The implications of this research could be vital to our efforts to slow or stop these diseases." The new research follows last year’s finding from the Oldstone group in collaboration with Bruce Chesebro, M.D., at the NIH’s Rocky Mountain Laboratories, which suggested a specific part of the prion protein is essential for the pathogenesis of prion diseases (Science (308 (5727):1435-39 (2005)). In this study, the investigators engineered scrapie-infected mice without an "anchor"-specifically the glycophosphoinositol anchor, a stretch of amino acids at the COOH end of the protein-between the membrane of cells and the prion protein. By taking off this anchor, the researchers showed that the prion protein still folded but was no longer able to attach in normal amounts onto the surface of cells. In contrast to scrapie-infected wild mice, which typically die after about 150 days, the engineered mice regularly lived for more than 600 days with minimal symptoms, ultimately dying of old age. In prion diseases, the normal form of the prion protein is converted into an abnormal, misfolded form. Disease occurs because these abnormal proteins have the ability to convert normal prion proteins into the abnormal form. Like bad apples spoiling the lot, the infectious prions will multiply, and their insolubility will lead to their aggregation and the formation of plaques, which can interfere with normal function in the brain. Of the prion diseases, most in the news has been bovine spongiform encephalopathy, or mad cow disease, which has caused widespread public concern over the last two decades after it has appeared primarily in cattle in England but also in other countries in Europe, Canada, and the United States. Perhaps the number one reason why a disease that infects cows is of such concern to world governments is that scientists believe that the disease can be transmitted across species through the consumption of tainted meat from a diseased animal's central nervous system. The first major outbreak of mad cow disease in Britain is believed to have originated with the now outlawed practice of feeding cattle meat and bone meal derived from other slaughtered animals. Chronic wasting disease in U.S. deer and elk is also of concern, as the abnormal protein has been found in both wild and farmed animals. Scientists now know that humans who eat meat from BSE-infected cattle may be susceptible to the prion disease new variant Creutzfeldt-Jakob. There are now more than 140 such cases. This incurable disease is named after a similar condition called Creutzfeldt-Jakob disease, after the German neurologists Hans Gerhard Creutzfeldt and Alfons Maria Jakob, who first diagnosed it. Creutzfeldt-Jakob disease most commonly strikes older people, and it causes neurologic abnormalities, dementia, memory loss, hallucinations, seizures, and eventually death. New variant Creutzfeldt-Jakob is similar clinically, but can strike much younger people. According to the U.S. Centers for Disease Control and Prevention, the median age of death for Americans with Creutzfeldt-Jakob disease is 68, whereas the median age of death of people with new variant Creutzfeldt-Jakob in Great Britain, where most cases have occurred, is 28. Authors of the newly released study, entitled "Prion-induced amyloid heart disease with high blood infectivity in transgenic mice," (Science, 313:94-97 (2006)) are: Matthew J. Trifilo, Toshitaka Yajima, Yusu Gu, Nancy Dalton, Kirk L. Peterson, Richard E. Race, Kimberly Meade-White, John E. Portis, Eliezer Masliah, Kirk Knowlton, Bruce Chesebro, and Michael B.A. Oldstone. The research was supported by a program project grant for the study of prion disease from the NIH’s National Institute on Aging. Beets may be one of those vegetables you see at tailgate markets or the grocery store and want to buy... but have no idea what to do with them once you get them home! Last week when I was on vacation visiting family, my dad dug some beets from his garden for me to take home. I peeled them, sliced them and cooked them in a steamer basket for about 10-15 minutes, or until fork tender. I tossed them with a bit of soy margarine and a pinch of finely ground sea salt. Yum! The sweet, earthy flavor brought back memories from my childhood when we ate beets several times a week throughout the summer. 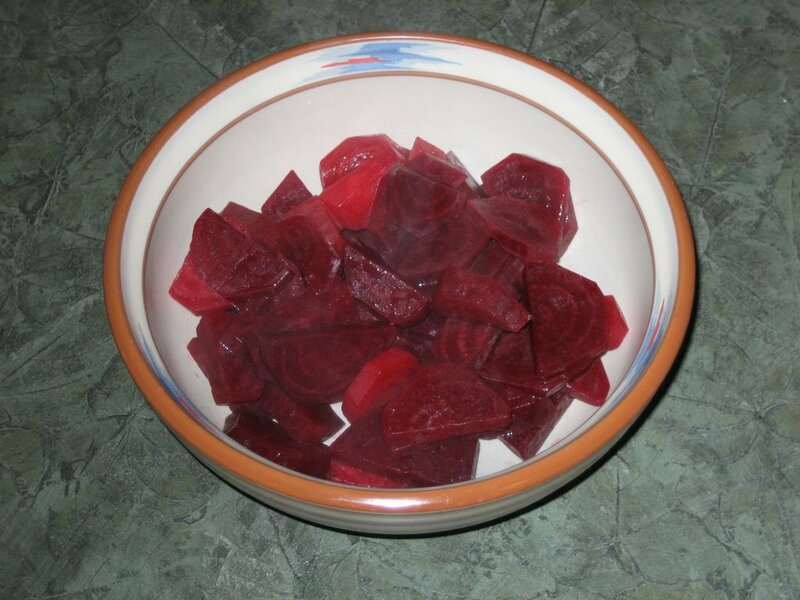 While low in calories, beets are high in folate, magnesium and potassium. Want to learn more about these unsung heros of the vegetable world? 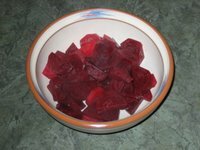 Click on http://www.whfoods.com/genpage.php?tname=foodspice&dbid=49 and cook up some tasty beets today! Dr. Amy Joy Lanou is a Senior Nutrition Scientist for the Physicians Committee for Responsible Medicine and Assistant Professor of Health & Wellness University of North Carolina at Asheville. She's an expert voice for plant-based nutrition who is interviewed widely in the national media. Dr. Lanou has also worked with the influential Dr. T. Colin Campbell and his son, Nelson Campbell, in various capacities for five years, writing and editingg the newsletter and Web site—New Century Nutrition — and developing a Web-based health promotion program for his company BioSignia. Been enjoying a diet entirely built from plant foods for nearly 10 years now. I stopped eating red meat as a teenager because I felt lighter and better when I was competing as a runner when I avoided it. I became a low fat vegetarian when I learned in my sophomore year of college that I had very high blood cholesterol levels. I was determined to control it with diet because the cholesterol lowering drugs the doctors wanted to prescribe had not been tested on women of childbearing age. Became vegan after I heard Dr. T. Colin Campbell show slide after slide of data about the atherogenic properties of casein (milk protein). When I stopped consuming the little bit of dairy that was still in my diet, basically 1 cup of skim milk daily and about a tablespoon of parmesan a week, my cholesterol level fell about 50 points. So my “N” of 1 experiment convinced me that it was the right thing for my body. First, let me say that in 10 years I have only found one restaurant (and it was in North Dakota during a huge motorcycle rally) that could not come up with something vegan to offer me. I encourage everyone to ask graciously for what you want and tip well when they are able to accommodate you. With all of us in force training food service establishments to meet our needs, things will just keep getting better. My favorite stories involve getting lots of yummy vegan food at fancy restaurants—usually a plate of vegetable sides—for less than half the cost of an entrée and having others at the table wish the had ordered what I did. I cook and share yummy vegan food. Steamed artichokes with curried veganaise. Tofu—it’s just so darn versatile. Blueberries; hot chai tea with soymilk; and sourdough olive bread topped with avocado, balsamic vinegar, and black pepper.